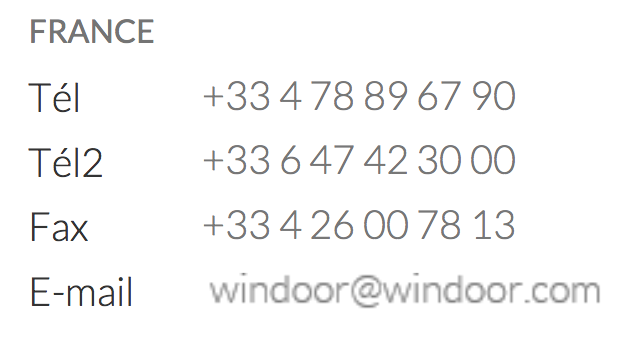 WINDOOR S.A is a Swiss-French company initially established in 1992 in Geneva, Switzerland. 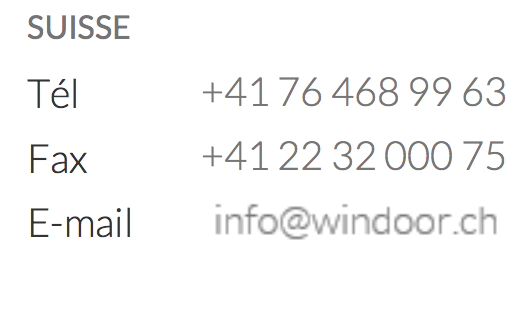 Windoor differentiates itself in this niche market place by the small size of its team, a great dynamism, a strong commercial reactivity, an in-house R&D team and a perpetual quest of innovation of a team steered by a manager with 40 years of entrepreneurship and commercial experience. At Windoor we design, engineer, manufacture and sell a full range of embedded products for trucks, lorries, commercial vehicles, vans and other professional vehicles. Our solutions include anti-theft locks, tracking systems, electronic security solutions, access control and rear-vision systems. We serve a niche market : the field of security solutions for truck manufacturers (first mount and retro-fit), road logistic & transportation companies (and their customers) and fitters of special vehicles. Indeed there is a growing need to secure the vehicles, their operators and the goods being transported. Windoor has become a leading and reliable partner that has contributed to the securing of the road logistics chain through an innovative and efficient solutions : mechanical anti-theft locks, electro-mechanical anti-theft locks, remote locking & unlocking of door trucks, access control management via web-based platform, GPS tracking, rear-vision systems, rear-view cameras, radar sensors, DVR event recorders, black boxes, etc. Windoor is also known for its CARE-CODE, a smart device to open motorised garage doors by simply flashing the vehicle headlights! It offers a full range of solutions to lock doors of heavy trucks and lorries. The brand was established more than 10 years ago. Thousands of CARE-LOCK® locking systems have been installed on trucks and have seriously raised the level of protection of the goods being transported. On contrary to the wide-spread mechanical locks (the “hockey puck padlock” type) that are visible from the outside our anti-theft lock are electro-mechanical are fully invisible from the outside. Thus, there is no visible lock to be picked on. Whether you transport stamps, medicine or luxury handbags in a van, commercial vehicle or truck, our rugged lock ensure a very high level or protection of the vehicle doors. The lock comes with a master control box allowing you to lock and unlock the doors either simultaneously or separately with the remote control (either the original remote control or the Windoor version). What’s more this locking system can be connected to the CARE-FLEET® solution if you require to track the vehicle in real-time or if you expect to have full control over the locking/unlocking of the doors. Windoor puts at your disposal a dedicated web-based platform. This is the light version of the CARE-LOCK® range. Indeed while CARE-LOCK® is suited for heavy trucks and lorries, the CARE-LOCK®LIGHT is specifically designed for vans and all types of commercial vehicles. This range was created more than a decade ago. It consists of anti-theft electro-mechanical locks designed to secure the doors of vans and commercial vehicles. Over a decade we have provided this anti-theft locking solution to a growing number of companies in the field of road transportation, logistics and companies requiring to secure their added-value cargoes (samps, medicine, luxury goods, etc). CARE-LOCK®LIGHT anti-theft locks are also invisible from the outside on contrary to the classic “puck type” mechanical lock. A sticker on the vehicle doors also works as a deterrent for thefts. We have also developed installation kits for almost all types of vans and commercial vehicles currently in the market. This makes our anti-theft locks a simple and fast solution. What is more this system requires no drills in the visible body of the vehicle which means a greater resale value. Our electro-mechanical are remote controlled, either using the existing vehicle remote control or the Windoor version. For customers requiring full control over vehicles and cargoes, our anti-theft locks can be connected to our CARE-FLEET® to track and control opening & closing of the vehicle doors afrom your smartphone or computer. Since the launch in 2005 CARE-VIEW® has evolved into a full range of vision systems for trucks, commercial vehicles and various types of professional & industrialvehicles : rear-view cameras and monitors, bird view, side cameras, smart LCD mirrors, anti-explosion cameras, radar sensors, dash cams, event recorder, etc. These systems allow the driver to manoeuvre with increased safety by removing blind spots and minimizing the risk of collision with persons or fixed obstacles. The CARE-VIEW® systems are meant for trucks, lorries, buses, coaches, road work vehicles, agri-food vehicles and any type of emergency response vehicles (fire fighters, Police, ambulance, safety patrols, etc). We have a vision system for almost any requirement, from low-cost rear-view camera & monitor to more advance 360° bird view or wireless quad systems. Almost all our cameras rugged, dust-proof and are water-resistant rated IP67 to IP69K. We also have special purpose camseras such as ATEX-certified ant-explosion cameras. Each rear-view system comes with one or several cameras and monitors. Of course it is possible to build your own kit based on your requirements. This range is the brain child of our R&D team and covers all the electronic anti-theft and vehicle control solutions. Thanks to the extensive experience of our team since the company inception in 1992 we have developed custom solution for new and existing customers. All these products are designed, engineered and assembled in France; most of them have R-10 certifications. 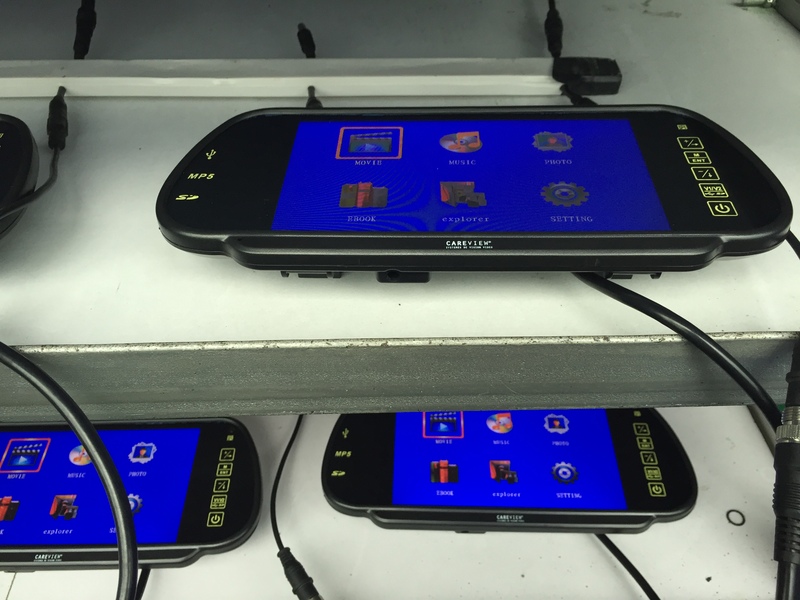 Among these products are anti car-jacking and anti mouse-jacking solutions. These solutions are encrypted and wireless making it far more secured than any similar solution in the market and far cheaper than the tracking solutions that don’t prevent the actual theft of the vehicle. What is more our solutions are scalable : whether you have one luxury car to protect or a whole fleet of vehicles we have the solution. And options are numerous: timing restriction (duration or time frame), user restriction, etc. This is therefore an unrivalled solution for operators of large fleet of vehicles. This is a smart device that allows you to open your (motorized) garage / warehouse doors by simply flashing the headlights of your vehicles. It is made of a transmitter installed in the vehicle and a received connected to the motorized system of the door. You then specify the number of flashes to open the door (1 flash, 2 flashed or 3 flashes). You can contact us if you have a special requirement and can meanwhile discover this system on our website http://care-code.com. Our R&D team is led by an electronics engineer who has been in this field since the inception of car alarms in the 80’s and 90’s. 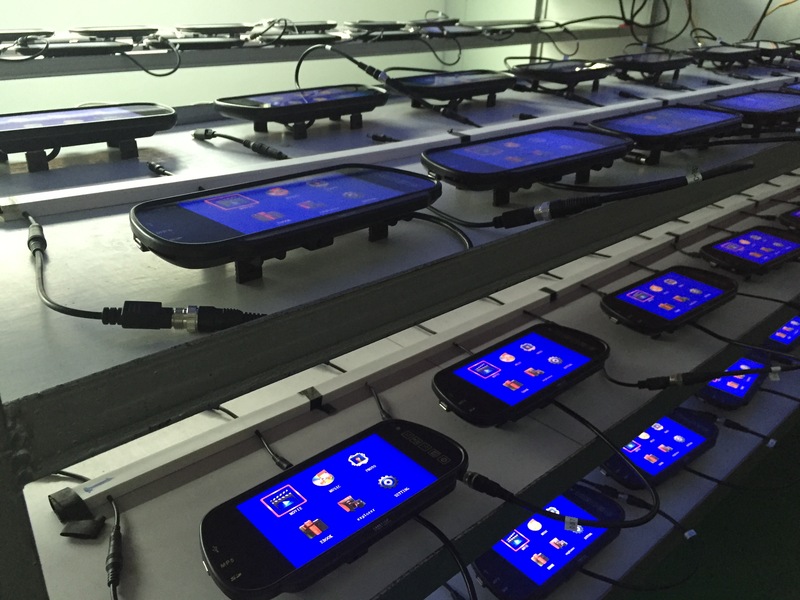 our R&D team can work on special requirements and can offer a wide range of RFID transmitters and receivers. Thanks to our FOUR-TALK technology we can develop and offer custom and safe solutions for your vehicle control and safety. 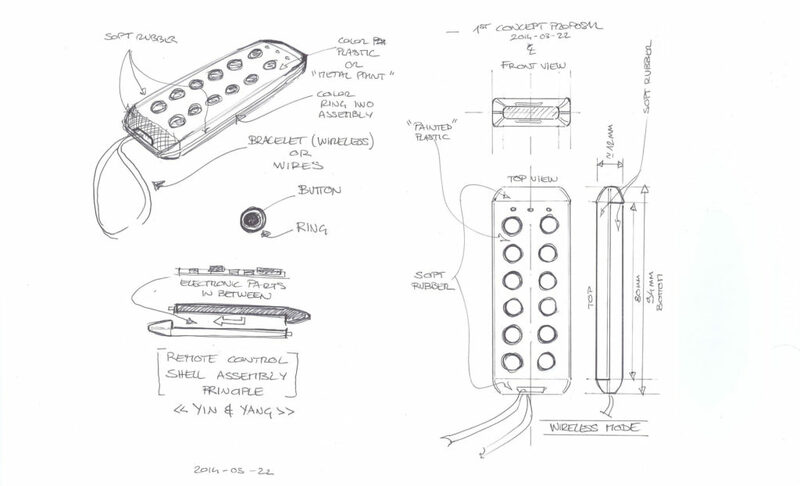 Many products of our range are either Swiss Made or assembled in France. The vision systems are manufactured by our partners and sub-contractors in Asia (Korea, Japan, ROC, Taiwan). Windoor has been active in the sourcing of such products since 2004. This has ensured the best quality-price ratio for our customers since 2005. What is more most our vision systems have undergone stringent testing phased and have R-10 certificates in our name.